This entry was posted in healing, shaman, shamanism, soul recovery, soul retireval on December 4, 2015 by Debbie. We often hear that the shaman travels “between worlds”. When asked how we travel through time to recover soul pieces, we often say it is because in the dimensions we travel, there is no time, space or distance. That the spirit world is non-linear. “The shaman is one who chooses to “walk between the worlds” of everyday reality and the spirit realms for guidance or healing. They are able to slip out of their ordinary reality into an “altered state of consciousness”. In this state of shamanic consciousness, the shaman is aware of both the physical world and the spirit world or “Otherworld” at the same time. He/she acts as an interpreter for the spiritual realm. Shamans treat ailments/illness by mending the soul. The Upper World above is the realm of unrealized potential, higher knowledge, and enlightenment. It is the domain of gods, goddesses, and evolved teachers/Masters. Many people experience the Upper World as very ethereal. The light tends to be bright, although the spectrum of colors can include everything from soft pastels to complete darkness. The landscapes in the Upper World are varied, and you might find yourself in a crystal city, phenomenal places of learning (i.e. classrooms and libraries) or simply in the clouds. In our training, this is where souls go when they are “taken to the light” to rest and prepare for their next journey. Here the shaman meets with teachers and ancestors who will aide the shaman through training and who will help guide the shaman in his/her work. Shamans also come here for cosmic wisdom, divine inspiration, insight, or to find ways to restore balance within themselves, their clients and Nature. The Middle World is our reality as we know it. It is our day to day lives and the residing place of our physical bodies and our normal waking consciousness – the spiritual dimension of our physical world. Middle World journeying is a way of communicating with the spirits that live in all things present in our physical reality (Nature, pets, weather Spirits, the Moon, etc). It’s so parallel to the world we live in that we can visit all the places, people, and things we know in our ordinary reality. Shamans typically journey to the Middle World to find lost and stolen soul pieces, lost or stolen objects, or to do long-distance healing work. The shaman many come to both the Middle World and the Lower World to commune with Nature. The Lower World is the realm of animal, plant and nature spirits, spirit guides, and the Land of the Dead. The Lower World is often be seen as being the place where evil spirits live, darkness pervades, and in general, not a good place. This is mainly due to our cultural conditioning of “Hell”. While the Lower World can contain some “not so nice” people and places, it is not a place of evil or Hell. The landscape in most places of the Lower World tends to be earthy, filled with mountains, deserts, dense jungles, and forests – the realm of Mother Nature. This is where guardian animals(Animal Guides/Allies) or helping spirits are found. It can also be a place of tests and challenges. This is where we often find soul pieces of those who are suffering and stuck. A spirit journey to the Lower World is generally undertaken to seek the help and guidance of an animal spirit, to recover lost power, or to find and return a sick or stuck person’s wandering spirit. Shamans are said to travel to these worlds by climbing the World Tree. 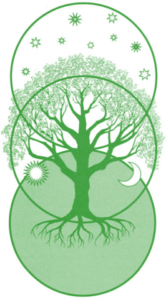 The World Tree is the bridge that connects these three worlds; it is the central axis about which the universe of the shaman extends. And it is on the Tree that the spirits pass from one world to another. The roots of the World Tree touch the Lower World. Its trunk is the Middle World and its branches hold up the Upper World. This entry was posted in shaman, shamanic journeys, shamanism on March 31, 2014 by Debbie. Winter has joined us here in Oregon and nightly covering us with her blanket of deep white frost. If there was any moisture in the air, we’d certainly have snow. Since the beginning of Samhain (right after Halloween), I have been slowly moving deeper into my personal cave, covering up with warm blankets preparing to hibernate for winter. For me it’s just instinctive… weather turns cold… hibernate! Give me a snuggly blanket, a book and a pair of knitting needles and I’m one happy bear! This entry was posted in empty cup, shaman, shamanic journeys, shamanism, void, winter solstice, yule on December 16, 2011 by Debbie. This entry was posted in 13 Grandmothers, earth healing, global spirit, healing, link tv, plant medicine, shaman, shamanic connection, shamanism on November 7, 2010 by Debbie.